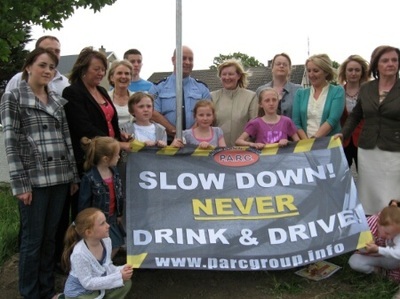 Road Safety Group PARC hoisted the first road safety flag on the night of the presentation of certificates in the competition initiated by Susan Gray Founder of PARC in memory of her late husband Steve. 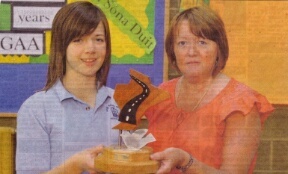 The Memorial Road Safety contest was held tonight in St Boden’s National School Culdaff. The other schools which submitted entries were: Scoil Mhuire, Gleneely, St. Columb’s Moville, St Patrick’s Boys School Carndonagh and Scoil Naomh Fionan Whitecastle. 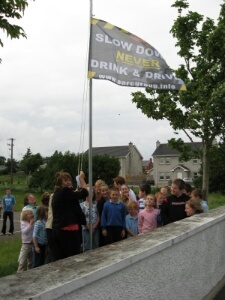 The purpose of the competition which commemorates her late husband who was killed in a car crash on St Stephen’s night 2004, was to raise awareness about road safety among the primary school children in Inishowen Co Donegal. There was a minutes silence observed in memory of Steve at the start of the ceremony. Steve Gray, while he worked as a hackney driver was also an accomplished artist. He worked with the children in some of these schools on a voluntary basis, teaching the children art and crafts and tutoring in the homework club. Present at the ceremony tonight were invited guests Sergeant James Collins, Jenny Mc Laughlin of the RSA, Mr Eamonn Brown Road Safety Officer and Mrs Ann Fogarty PARC member Wicklow. 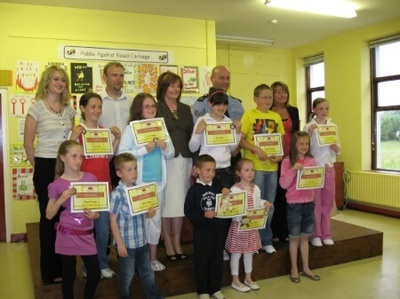 Thirty-four children received certificates and medals. The overall winner was Aine Mc Laughlin of Scoil Naomh Fionan, Whitecastle who was presented with the Stephen Gray Perpetual Trophy. Her artwork sent out a clear message about the importance of wearing your seat belt. Children from junior infants to sixth class took place in the competition. Mr Finbarr Gallagher and Mr Ambrose Mc Creanor teachers in the Carndonagh Commuity School made the trophy. It depicts the Inishowen peninsula with a dove of peace. Susan Gray and Ann Fogarty from PARC were delighted with the interest shown in the competition, the high standard of the entries and the large turnout on the night. PARC’s aim is to have all schools in Co Donegal involved in this competition in future years. The future of road safety lies in the education of the very young.